REVIEW: HERO IS AN UNIMPRESSIVE REMAKE! Athiya shows potential, Sooraj his physique in a film that dishes out inadvertent hilarity in abundance, says Sukanya Verma. Such unintentionally hilarious throwback to the age of campy flourish is permissible given Nikhil Advani’s Hero is an official (if not entirely faithful) remake of Subhash Ghai’s glitzy hit that made stars out of Jackie Shroff and Meenakshi Seshadri and gave us the 80s anthem, Ding Dong O Baby Sing a Song. Only the new Hero isn’t set in 1983 and the original’s ‘top cop’s daughter falls for a golden-hearted crook’ narrative has long bitten dust. Unsurprisingly, this struggle to fit a modern-day romance in a dated template prompts a patchy, wobbly, bizarre, humourless drama proving an uphill task for two rank newcomers to tackle. Ultimately, isn’t Hero’s sole purpose to bring Athiya Shetty and Sooraj Pancholi to our attention? Remember, there’s an unstated genre in Hindi movies -- show reels purely designed to highlight the attributes of dedicatedly groomed star kids. And so Sooraj plays Sooraj -- because Jackie’s name cannot be taken in vain -- a Robin (yawn) Hood-inspired street ruffian working for the devious and influential Suryakant Pasha (played by his charismatic daddy Aditya Pancholi). Regrettably, he calls him Baba not Nawab. Sooraj’s introduction scene has him perform some fancy-schmancy, acupuncture-themed push-ups over a spiky surface before the camera zooms in and out his beefed up, heavily tattooed torso. It’s not long before Advani directs him to beat up an even more brawny bad fella (grim as ever Chetan Hansraj). It’s hardly a fair fight and not once convincing. What else can he do? Hero is desperately eager to get on with the checklist. Sorry, no flutes this time. Dancing in a discotheque is next on the cards, also making way for Athiya’s entry. She’s striking, statuesque, stylish, a live-action Pocahontas and a far better dancer than her action hero father Suniel Shetty. If only the soundtrack could produce one song that’d match up to Laxmikant-Pyarelal’s vivacity. You’re initially led to believe Radha isn’t the cloyingly sweet, coy heroine what with her constant brags about boyfriends, break-ups, drinking and swear words. But she turns out to be just another lame Katrina Kaif from Jab Tak Hai Jaan in disguise vowing to give up corrupt habits like her alcohol, non-vegetarian (pro #meatban, this girl?) and bad language (muppet/stupid/jerk) if her wish comes true. Needless to say, her wish is for Sooraj who she falls in love after a sighting of his bare upper body. It’s a sealed deal after he brings her a pail of hot water for bath. As for him, I couldn’t tell if it’s Radha or her freshly shampooed hair he’s really after. He’s kidnapped her on Pasha’s behest but she’s misled into believing Sooraj and his cronies are police officers sent by Radha’s father (a surly Tigmanshu Dhulia) to safeguard her in snow-clad Himachal Pradesh. Technology is far more advanced than it was thirty years ago but Hero’s too lazy to be clever or creative and clumsily cooks up any bunk to move forward. Advani keeps a check on it for some time -- a nifty action piece, sprinkles of sweet nothings but post-intermission onwards things go completely awry. Even if undeniably kitschy, Ghai’s Hero treads the theme of reform and second chances spruced up in his signature showmanship and lasting melody. What you see here instead is a bunch of jaded jailbirds granted parole for showing exemplary conduct at washing their own laundry? Skipping details, full of choppy screenplay and half-baked characterisations emerging even more dated than its predecessor, what Hero dishes out in abundance is inadvertent hilarity. Flimsy dialogues like Ctrl+Alt+Del, dramatic posturing against strategically concealed table fans, pecking the girl’s cheek when meaning to lock lips, heroine slipping into a salwar kameez dress code post-interval to suggest sombre, a dance event called Wanted for Love (as possibly some sort of acknowledgement to its star producer Salman Khan who’s acted in both Wanted and Love) -- Hero is so puerile, it hurts my jaws. At the end of its ‘Lambi Judaai’ phase, Aditya Pancholi’s greyed so much; it’s an indication of how long Hero feels even at 132 minutes. What matters in any debut is the presence and freshness of a newcomer. Obviously, Jackie Shroff and Meenakshi Seshadri didn’t deliver their career best in Hero but they brimmed with promise and poise. 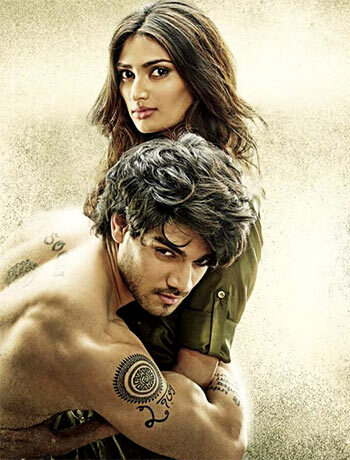 He’s sure worked on his physique but Sooraj is dull and low on magnetism. The youngster tries too hard to fit in the space of his mentor, Salman. He’s okay in scenes where he doesn’t need to speak. As is Athiya, her dialogue delivery alternates between grating and goofy. Except occasional flashes, their chemistry is tepid and devoid of passion or playfulness. Honestly, I wasn’t floored by either of these newcomers in the acting department. Although I do think Athiya has the potential to do better if she plays her strengths. She looks tough, spunky and original -- she ought to project it better. Same goes for you Bollywood, about time you used your imagination to create a brand new Hero instead of living off past laurels. That’ll be worth a sing-a-song!